Please forgive me for not posting since before the holidays. First let me say I pledge to all of our wonderful Joe Andruzzi Foundation followers that I will be posting more frequently in 2010. You all do so much for the foundation I owe it to you to share what the foundation is doing on a weekly/ bi-weekly basis. I truly do have so much to share with everyone. Now this is going to sound silly, but so true. I realized after watching “Julie and Julia” that my posts don’t have to be perfect like a columnist the words just have to be typed as if I was speaking to all of you out loud. Now I love to talk so that should not be a problem. Let me catch you up on what Joe and I have been up to for the last month and a half. 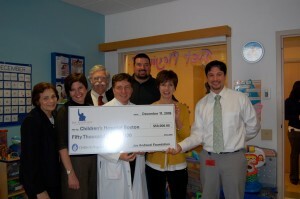 On December 11, 2009 Joe, Credit Union Kids at Heart, Lucy and Carter Buckley and I went to Children’s Hospital Boston and presented Dr. Mark Kieran with a $50,000 check to the C.J. Buckley Brain Cancer Research Fund. During our visit we were able to meet a few patients. Let me tell you something, I think these kids know something we don’t know about being tough. To be tough you have to do it with a smile. The smiles on the kids faces we met were amazing. Here they are sitting in their hospital beds and all they can do is smile. Amazing! Needless to say every time Joe and I go to the hospital to visit patients we walk out smiling because the patients give us the encouragement to keep doing what we are doing. During the whole month of December Joe visited some local families at their homes that are battling cancer to give them some encouraging words. Once our children were home on winter break Joe and I each said to each other let’s turn off the working clock and spend time our family and friends. I have to share with you the most important thing Joe and I learned during the time he was sick in 2007 was to live everyday to it’s fullest and to hold your loved ones as close as you can. That is exactly what we did. We spent as much time as we could with our family and friends during the kids winter break. Now here we are the 3rd week in January with so many things to tackle in 2010. 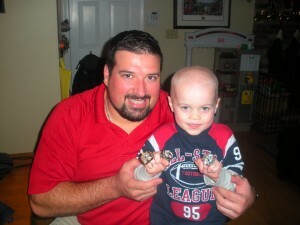 Here are just a few things that the Joe Andruzzi Foundation WILL tackle in 2010. Partnering with local cancer institutes to make sure we are we are doing our best to help with patient and family programs. Launching the official Joe Andruzzi Foundation web site which will share how each and everyone of you can help lead the fight to tackle cancer. Raising awareness in New England about donating blood, platelets, stem cells and becoming a member of the National Bone Marrow Registry. Lastly let me say over the holidays we had some of our Joe Andruzzi Foundation families lose their loved ones to the terrible disease of cancer. Please pray for those families that have lost loved ones in 2009 and in the beginning of 2010. God bless each and everyone of those families!